By Celestine Betingi – Monday March 18, 2019. Picture of Minister Atanga Nji extracted from a video of his visit sent to National Telegraph. Wonders they say shall never end, an observer said while describing the attitude of the Cameroonian government as nonchalant and only geared towards letting the populations of the English-speaking regions that they are indeed not part of Paul Biya’s Cameroon. Our source was reacting to a recent Humanitarian visit of Cameroon’s Minister of Territorial Administration to the country’s South Region. According to on-the-ground reports gathered by National Telegraph, Paul Atanga Nji was touring some areas of the South, bringing gifts and greetings from President Paul Biya. Minister Atanga Nji visited the populations of Mbileme and Meyomessi in Sangmélima Sub-division, Dja-et-Lobo Division with building materials and some financial aid to victims whose houses were torched by a fire disaster in the precinct. The Minister also donated a trailer full of timber and other building materials to the populations, particular to a government school in Meyomessi after heavy winds blew off the roof. Minister Paul also assured school authorities more would be sent in case of any shortages. National Telegraph gathered that at least 200 houses were burnt down by wild fires and the Minister was in the South at the behest of Cameroon’s President Paul Biya, 86 to bring relief materials to victims. This isn’t the first time the Biya Administration is acting with promptness in matters regarding the populations of the French Regions. 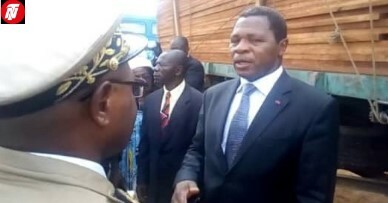 On Thursday, February 28, 2019, at the behest of Paul Biya, Cameroon’s President handed over cash to some victims of a fire incident in Marche Congo, the second largest market in the city of Douala located at Douala II Sub-division in Wouri Division, Littoral Region. In Bangourain in the West the government also acted promptly when houses were torched. Atanga Nji flanged by the Governor of Littoral, Samuel Dieudonne Ivaha Diboua and the Senior Divisional Officer for Wouri, Mache N. Joseph Bertrand at the Conference Room of the Douala City Council in Douala I Sub-division, personally distributed cash worth over thirty-two million francs (32.000,000F CFA) to victims of the Douala fire incident. News of government compensating traders and residents in the French part of Cameroon has been poorly received by many in the two English-speaking regions of the country who have suffered colossal losses resulting from numerous fire incidents. At least, thirty buoyant markets and hundreds of villages have been burnt down in these regions, mostly by Cameroon soldiers, yet the Government has never bothered about providing relief to victims or even making consoling statements. Previous Trump’s Envoy, Cameroon’s External Relations Minister Discuss Key Issues. Next Cameroon: Strapping Wind, Heavy Rain Hit Douala. God is on the side of the downtrodden. We will overcome. We don’t even want anything from them.